This page will show you how to calculate sheet resistance of a layer of metal versus frequency. By the way, what we call "RF sheet resistance" is often called "surface resistance" or "surface impedance" or other names in textbooks. The term sheet resistance should be familiar if you work with electronic thin films. It is a function of the bulk resistivity of a metallic film, and its thickness. We discuss it further on this page. Sheet resistance, Rsh, is given in ohms per square, where squares are the unitless dimension of length divided by width. Something that is not often considered is that sheet resistance is a function of frequency. Applied in the RF world, errors can result from using the DC definition. Knowing RF sheet resistance versus frequency of interconnect metals (copper or gold for examples) can be a very useful short-cut for evaluating attenuation of strip conductors such as microstrip. 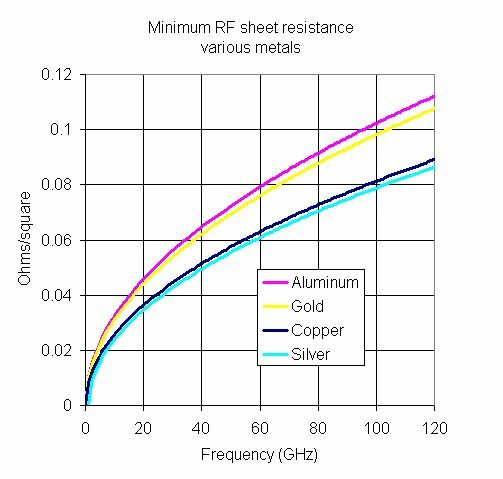 We offer a free download that you should grab if you want to analyze RF sheet resistance of various metals (including stacked metals) that you specify. Look for it here. It's near the bottom of the page. Sheet conductivity is the inverse of sheet resistance, its units are Siemen-squares, or mho-squares. This quantity is useful when you are dealing with multiple-layer conductors, as their conductivities can be added in parallel, then the sum can be re-inverted and expressed in a composite sheet resistance. When RF is involved, the so called skin-effect can become apparent, and therefore DC calculations of conductivity and resistivity are invalid. The skin effect is taken into account by using a decreasing exponential factor whose exponent is inversely proportional to a parameter called skin depth. Maximum sheet conductance is the best you can do, and is a function of frequency. Adding more metal beyond five skin depths doesn't help! Voila! that equation looks an awful lot like the DC sheet resistance equation (top of page) except the skin depth is now in the dominator instead of the conductor's thickness. Remember, this is the best you can achieve, no matter how much more metal you add to the transmission line! Now let's look at what this means for various metals. Click here to look up conductivities of various metals. The plot below compares aluminum, gold, copper and silver. Silver is best, followed by copper, then gold, then aluminum. At DC you can achieve nearly zero sheet resistance, because the skin depth is infinite. But to get truly zero sheet resistance, you'd need infinite metal thickness! The minimum sheet resistance will have an effect on the transmission line loss, which you can read about on this page. In any case, how about a rule of thumb? The minimum RF sheet resistance you can achieve is on the order of 30 milli-ohms/square at X-band, and increases as the square-root of frequency up to 100 milliohms/square at W-band. The exact value will depend on the metal's conductivity. Here's some example RF sheet resistance calculations. Here's the special case of high permeability metals.